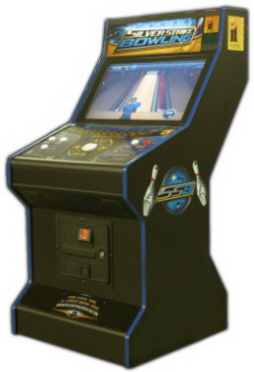 this powerful offline version of Silver Strike Bowling ! • Stunning 3D Real-Time Pin Action and Ball Physics ! • Innovative Trackball Creates Realistic Hook Shots! • Interactive Player Camera For Quality Instant Replays! are instantly replayed in the attract mode of the game! home / office / club tournaments and leagues a snap ! you add the Integrated TV Bracket Mount shown below. Available in (5) Different Models ! From Left to Right : 26" LCD, 32" LCD, FunGlo w/Opt Stand and Monitor, FunGlo and 32" Showpiece Models. 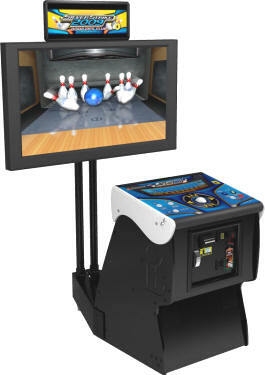 selling video bowler - It’s bowling brought to a new level ! about all your best shots while they are instantly replayed! set on "Free-Play" for non-coin home or office use. of the fastest growing private firms in America. And the only firm in the coin-op industry that actively tracks customer satisfaction, with a current 99.4%Customer Approval Rating. to customer service, customer satisfaction, technical support, game repair, game selection, game information and vendor trust, BMI Gaming is the leader in the coin-op gaming industry! We offer our clients a vast amount of game and product information, along with a large collection of current game brochures, manuals and pictures, plus clearly defined, fair and honest store policies and extensive company information to be found anywhere in the world. is recognized by major publications as the leader in arcade gaming entertainment products ?